Pseudomonas aeruginosa is a leading agent of nosocomial infections. The most aggressive strains possess a secretion system injecting various toxins directly in the cytoplasm of target cells. We have recently isolated a novel hyper-toxic clinical strain of P. aeruginosa, named CLJ1 that does not possess this secretion system, but instead releases a pore-forming toxin called ExlA. In addition to membrane toxicity, CLJ1 demonstrates high proteolytic activities towards E-cadherin, an intercellular junction adhesive protein required for epithelium integrity. Infection of mouse lungs with CLJ1 induced an hemorrhagic pneumonia, a symptom that was also observed in the patient from whom the strain originates. Eighteen other ExlA strains have been collected from 5 continents, demonstrating that these taxonomic outliers have already spread worldwide. The genetic analyses show that the strains belong to two phylogenetically divergent groups, probably originating from two different ancestors. Their cytotoxicity is highly variable and is correlated with ExlA secretion levels. The highly virulent ExlA strains are toxic for most cell types. Furthermore, the strains exhibited differential toxicity in mouse and in planta, suggesting that animals and plants are sensitive to different modes of virulence. Transmission electron microscopy images of infected mouse lungs show major lesions of epithelial and endothelial cells when mice were infected with ExlA-positive strains. The plasma membrane is disrupted and the cytoplasmic components are liberated in the extracellular spaces, confirming previous observations on infected cells. This figure is highly different from that obtained for lung infection with classical P. aeruginosa strains. Lung barrier destruction allows bacterial dissemination in the mouse body. ExlA pore formation in the host plasma membrane induces a calcium influx that activates the transmembrane metalloprotease ADAM10. The protease then cleaves its natural substrates: E-cadherin in epithelial cells and VE-cadherin in endothelial cells, leading to cell-cell junction disruption. Reboud E, Bouillot S, Patot S, Béganton B, Attrée I and Huber P. Pseudomonas aeruginosa ExlA and Serratia marcescens ShlA trigger cadherin cleavage by promoting calcium influx and ADAM10 activation. Submitted. Bouillot S, Munro P, Gallet B, Reboud E, Cretin F, Golovkine G, Schoehn G, Attrée I, Lemichez E and Huber P. Pseudomonas aeruginosa Exolysin promotes bacterial growth in lungs, alveolar damage and bacterial dissemination. Sci Rep. In press. Huber P, Reboud E, Basso P and Attrée I. 2016. Pseudomonas aeruginosa renews its virulence factors. Env Microbiol Reports. doi: 10.1111/1758-2229.12443. Reboud E, Elsen S, Bouillot S, Golovkine G, Basso P, Jeannot K,; Attrée I* and Huber P*. 2016. Phenotype and toxicity of the recently discovered exlA-positive Pseudomonas aeruginosa strains collected worldwide. Env Microbiol. doi: 10.1111/1462-2920.13262 * Equally contributed. Elsen S*, Huber P*, Bouillot S, Couté Y, Fournier P, Dubois Y, Timsit JF, Maurin M, Attrée I. 2014. 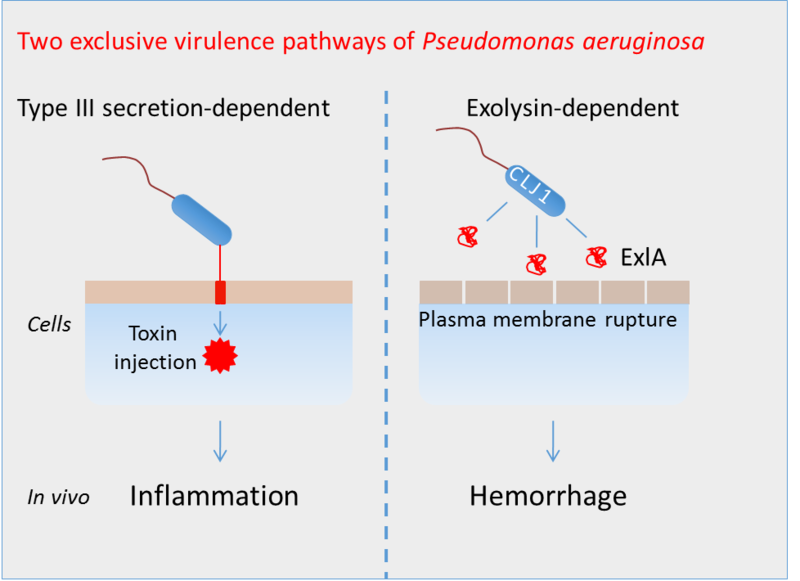 A Type III Secretion negative clinical strain of Pseudomonas aeruginosa employs a two-partner secreted Exolysin to induce hemorrhagic pneumonia. Cell Host & Microbe 15(2):164-76 *Contributed equally.